Cut in a direction away from fingers and hands. When you are done using the scissors, place the scissors away from table edges so they won’t fall to the floor. Even better, store your scissors in their protective cover or box. You don’t need scissors to accidentally fall and injure the dog laying at your feet, the baby crawling around or you. Another tip that we all learned in school and should still practice: Hand our scissors to another person so they will receive the handles of the scissors. Keep your scissors sharp. 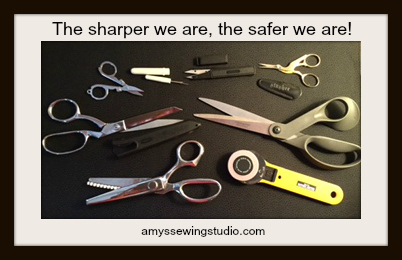 You can find a service close to you that will sharpen sewing scissors, or buy your own scissor sharpening tool. I just bought my own Fiskars Scissor Sharpening Tool and it works great! The point on the seam rippers are very sharp and it is very possible to accidentally poke yourself so please use with care. Keep the cover on the seam ripper when not using. Push the Sewing Rotary Cutter in a cutting direction away from yourself or any one else. Make sure your hands are behind the rotary cutter when using so you don’t accidentally run the blade into your hand. Slide the blade cover up over the blade when done cutting, even if you’ll be cutting again in a second; make this an automatic motion! Rotary blades can get dull, I always make sure to have spare blades on hand. You can tell when a blade is not as sharp as it should be because you will feel yourself adding more pressure to cut the fabric and the blade is not cutting all the layers of fabric. If you accidentally drop pins on the floor, pick them up right away so they won’t be stepped on, get picked up by a crawling baby or get caught in your pet’s fur. Don’t hold pins in your mouth, use a pin cushion or holder. Magnetic pin holders work great in helping you to pick up pins off the floor. Just hold the magnetic side facing the ground and pins just can’t help but wanting to stick to the magnetic pin holder. Speaking of PINS, learn about different types of sewing pins for beginners. Glue guns are HOT and you can get serious burns, so please be careful! These are not the most stable tool. Be careful WHERE you set the glue gun while plugged in, I try NOT to leave the cord hanging down anywhere. Usually I will have a piece of cardboard to set the glue gun on, cardboard protects your surface from the heat of the glue and the glue gun. I will have a big enough space that the cord can be just up on the table or counter so it won’t accidentally get caught on something and drag the HOT glue gun down to the floor or swing to hit you or someone else. Fingers can easily get burned from the heat on the fabric or steam from the iron. If I have smaller seams like when I’m quilting or doing appliqué, I use my quilters mini iron or you can use an Iron Finger. Be careful where you have the iron cords plugged in; make sure the cords will not get pulled on/tripped over from someone walking by. We don’t need irons accidentally falling to the ground and burning our feet, a pet or crawling baby! My arms have gotten burned from an iron before because I think I can reach over the iron to grab something or I’m just not paying attention at all! With all of these tools, read the directions for proper use and storage and only use them for their intended purpose! 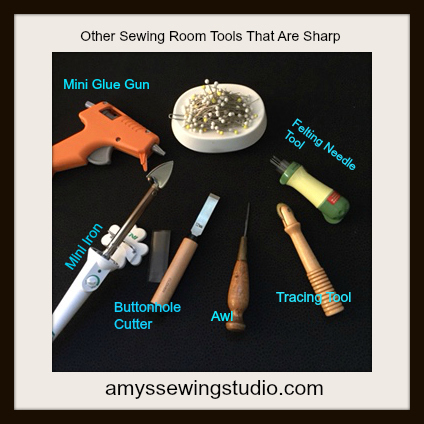 Put your hand sewing tools away when you are done and keep them out of reach! You’ve heard that saying, “out of sight, out of mind”, I can say it is true! Your kids watch you use these tools, even when you think they are not! Trust me on this one! They notice what you do and will want to try using your tools when you least expect it. You DON’T want your children or their friends getting injured, or ‘trying’ your sharp tools out on your sewing project! 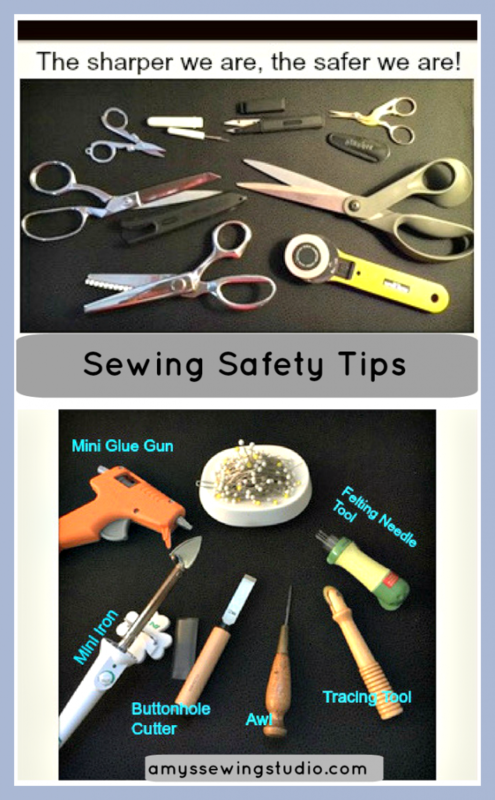 If you have older kids who will be using your tools, share these Sewing Safety Tips with them. A Toddler and a Rotary Cutter: Not a good combination and a true story! 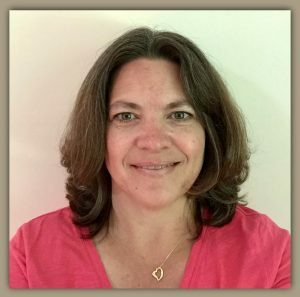 When my first born was not quite two years old , we had a big executive desk that I kept my sewing machine and sewing basket on. One day I had my tools out and I had put the tools toward the back of the desk, thinking they would be OK back there. The TV was on, I think we were watching Barney at the time, and I walked out of the room for a few minutes. When I came back, my jaw dropped to the floor and I almost had a heart attack! I saw my little toddler sitting on the floor with my rotary cutter all dis-assembled! I quickly went over and picked up all the parts and still to this day can’t believe how my son managed to take apart the blade without slicing a finger off! Sometimes we learn lessons the hard way, and this was my lesson I’m sharing with you! Put your tools up and out of sight! I still have to do this with my two teenagers-OUT OF SIGHT-don’t let them see where you put your tools either. You may have to change hiding places frequently! Sewing Room Storage Ideas: Where can you keep your tools out of reach from little hands? I have several types of containers I use. Some are clear plastic storage containers so I can still see what tools I have inside what box. My containers are kept on the upper shelves of a tall book shelve I have in my studio. I also repurposed a round box that a gift came in. The box already is decorated and looks cool sitting on my sewing table, this is where I keep tools I use the most, like scissors and rotary cutters, pins, and other stuff. Clear plastic storage containers are awesome! Because of the transparency, you can see exactly what sewing tools you have stored in them. Many containers like this have latching lids and are stackable. 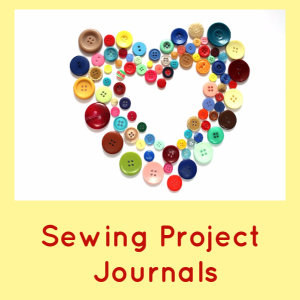 Having the sewing equipment/tools put away will hopefully take away the temptation for kids to want to use your things, at least that has been my experience. P.S-Because my containers are clear, I took little sheets of paper and actually made a list of what I have inside of the container, and placed the list on the inside of the container list side showing to the outside. This works especially when there are numerous smaller sewing tools or other sewing accessories. Multi-tasking does not work well with sharp tools-Focus on your task at hand. 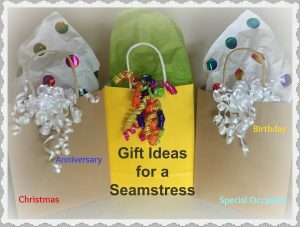 Slow down and enjoy your sewing! If you are in a hurry you’ll be more likely to get injured! When you buy new sewing tools, read the directions for use and safety storage.